The Glencoe that's not in the Scottish Highlands lies 30km north of Chicago, on the same side of Lake Michigan. It's a town of 9,000 whose mock-Tudor facades and leafiness would suggest a British suburb if the streets weren't so wide and on grids. 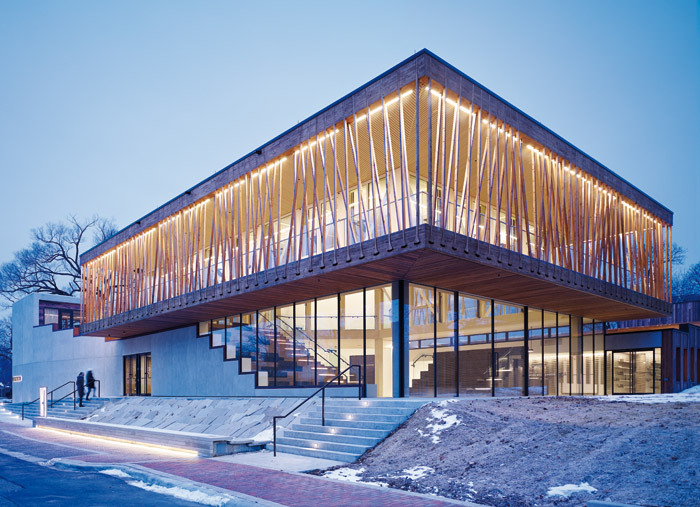 Chicago-based Studio Gang Architects' principal Jeanne Gang describes it as 'a very quaint village', yet it draws cultural sophisticates from the big city to take a train or drive up Interstate 94 for something rather special. 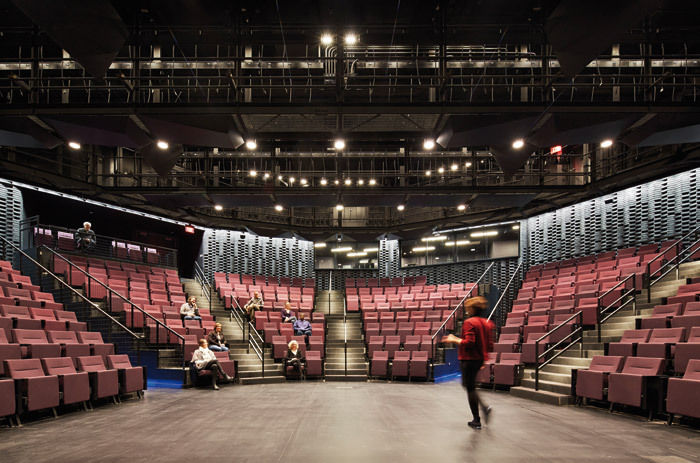 Since it was founded in 1992, The Writers Theatre has delivered just that - quality drama that brings the audience right up close to the performers. The Washington Post named it as one of the six best regional theatres in the whole of the USA. This February, the company moved into its new $28m Studio Gang-designed 3,345 sq m building. From a competition field of 30, the practice was commissioned in 2012 and construction started in 2014. 'After all the long effort, it's so nice to have it finally built!' says Gang. The audience should feel the same way, too, and not just about the drama - there's the distinctly contemporary new theatre complex itself. It's tailored to its audience and locale, but it tells the whole of the USA that timber is back. The theatre building is box volumes that include two dedicated theatre spaces and a green-roofed rehearsal room, which mass together and rise discreetly to no higher than 10.7m, about as high as anything in Glencoe goes. The most striking element is the signature upper-level gallery. It not only looks down through glass to the transparent lobby below, but also commands views out across the town through an extraordinary open screen. The gallery's square passage is cantilevered out from the ground floor, as far as 3m on one side. The structure is defined by a timber Vierendeel truss, but the exterior screen is far lighter. 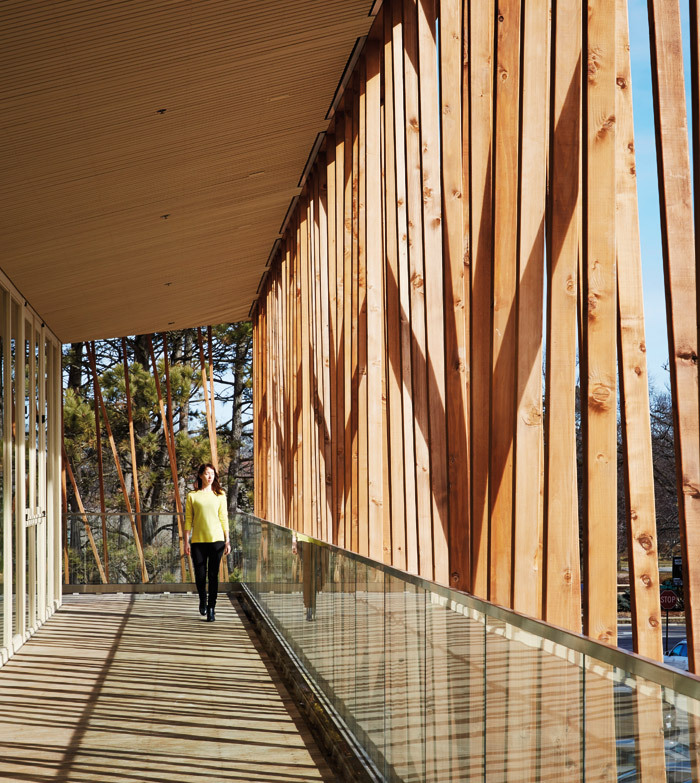 Between the horizontal frame beams are tension strung, thin, full-height batons of stained Port Orford cedar at varying angles to the vertical, which end with 'cat's paws' that grip into the beams. No bolts were used. The screen has two layers, offset to improve lateral stability. Port Orford cedar, also used in pencils, was chosen because of its performance and resistance to rot, and although not FSC certified it is required by American laws to be replanted after harvesting. 'I really wanted this screen to be working structurally,' says Gang. To overcome scepticism about its viability, she called France-based, British lightweight-structure engineer Peter Heppel, who has worked with masters from Frei Otto to Renzo Piano: 'I thought he was the perfect person to give everyone confidence and come in to this specific thing. He worked with me on the [tensioned] marble curtains I did early on [for a show in 2004 at the National Building Museum, Washington DC], and the opening roof of the Bengt Sjostrom Starlight Theatre'. A section of Glencoe's screen was tested at Trillium Dell Timberworks, in a rig that literally tried to pull it apart. The gallery has something of Cristián Undurraga's diagrid-sided open passages of pine around Chile's pavilion at the Milan Expo, although his elements were far thicker and regular, and the varying baton angles even echo the trend for apparently random angles of exterior elements in, say, OMA's CCTV HQ or Herzog & de Meuron's Beijing Olympic Bird's Nest stadium. Of course, in Glencoe the scale is modest to match the setting, and the more charming for it. After sunset, the gallery shines light out through the batons, and by day the experience of being on it is like walking on air, or perhaps a canopy walk. 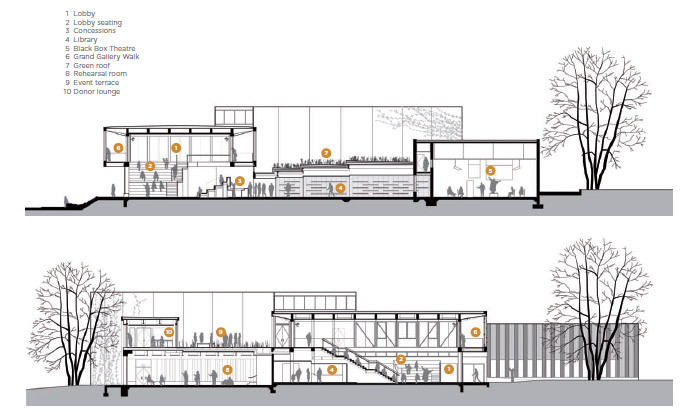 The lobby below, a few steps up from the street, is an airy double-height space that fills with daylight. 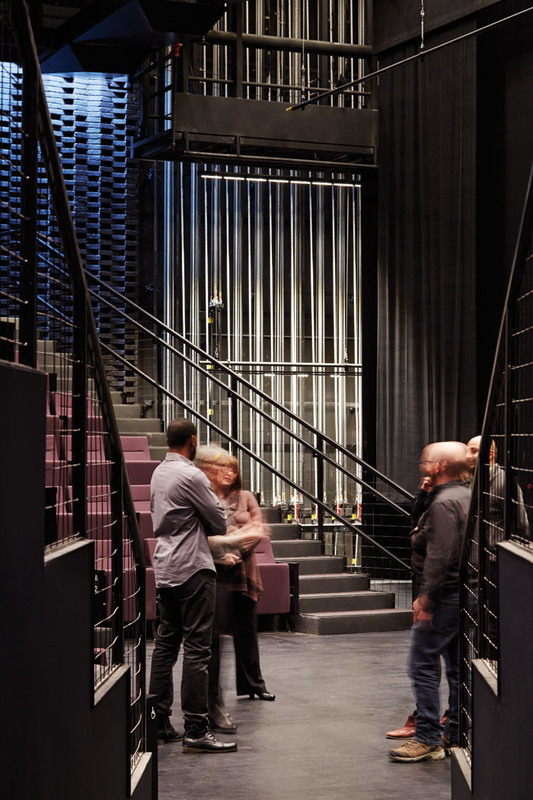 It is the Writers Theatre's hub and offers a choice of directions to go -- to the cloakroom and lift, or the doors to the main theatre, or a corridor leading to the smaller theatre. All of those involve ticketing, but the lobby itself has free offerings. 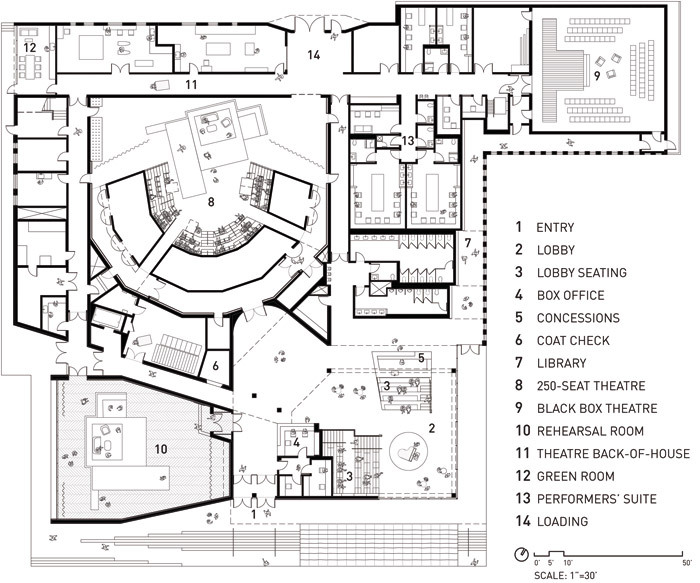 Two banks of terraced seating sit on the floor, providing for performance in the lobby itself (the plans illustrate that with a piano), or maybe meeting or just hanging out. It should draw the community in. The main auditorium holds 250 and is a steel structure with a concrete back wall. It is lined with bricks, reused from the 1938 building previously on site, the Women's Library Club, where the Writers Theatre had performed to packed houses, but with only 108 seats. The bricks form zigzags, partially latticed with alternative brick gaps, which play an acoustic role.